Your natural tooth is actually composed of multiple distinct layers. Below the white enamel, there is a hard, thick portion known as dentin. Beneath that, you’ll find the pulp, which contains blood vessels and nerves. When a serious infection or a traumatic injury allows harmful bacteria to infiltrate this vulnerable area, the result can be severe swelling and pain. Extraction may seem like the only option when faced with these symptoms, but root canal therapy could save the day. Please don’t hesitate to contact Lakeside Daytona Dentist if you’re in need of assistance. During this procedure, Dr. Silva will remove the inflamed pulp from within the affected tooth and then clean the area. 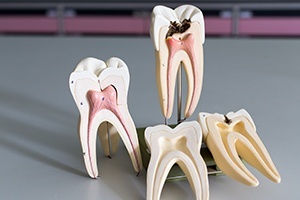 After filling the space with a biocompatible substitute and sealing it shut to prevent further infection, a custom-made dental crown will be the final touch. This restoration will both protect the treated tooth and restore its full ability to function. Many patients worry about the bad reputation associated with root canals, but this procedure is actually very comfortable with the help of today’s modern techniques and technologies. It’s also highly successful and helps countless teeth remain safely in patients’ smiles for years to come.